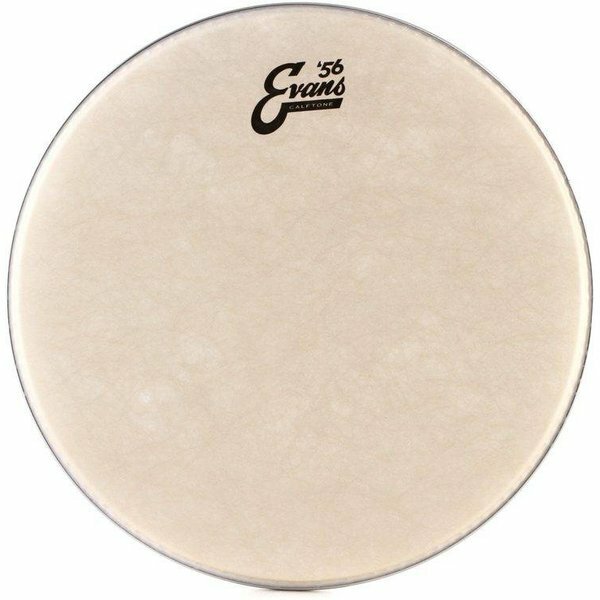 Home Evans Calftone Drum Head 16"
As a throwback to the year Evans was founded, Evans '56 is a new series of products geared towards drummers seeking a vintage look and sound. These heads bring out the best of a vintage kit and evoke a classic appearance and sound from modern drums. Completing the '56 series, we are now offering Calftone heads in a full range of sizes for tom and snare drums. Made with a 7mil film base and blended with unique materials these heads are thinner than our bass heads to help optimize the sound for smaller drums, higher tunings, and greater tonal response. The approach is identical to how natural skins are used across a drum set in which thinner skins are used up top and thicker skins are used down low for increased bass response. Just like our bass heads, the tom/snare heads will come in vintage-style Evans '56 Calftone packaging. Sizes available are 8-18".